Kahaluu Beach Park (pronounced: Kah-hah-loo) is a great spot to visit for all kinds of ocean activities and it's right in Kailua-Kona. It's not your classic long, white sand beach. But it's the perfect spot to learn how to surf or snorkel and it's one of the best picnic spots on the Island. 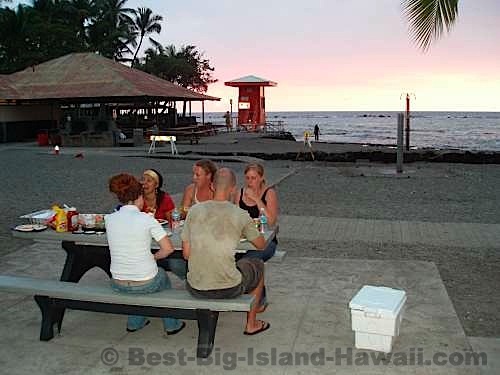 I love coming here during the day for snorkeling or surfing (or both) and staying for a sunset barbecue. Getting to Kahaluu Beach Park is easy. 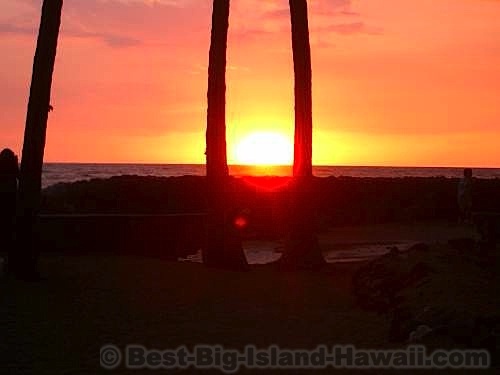 It's right on Alii Drive (Ah-lee-ee) just a few miles South of Kona right at mile marker 5. There's quite a bit of parking right at the beach at the South end of the bay, but on a busy day you might have to wait for a spot. There's also some parking available right on Alii Drive. The sand at Kahaluu Beach Park is of the rougher salt and pepper kind in the main park area. There's also some finer sand at the North end of the beach. A long rock wall separates the sandy area from the water. There are plenty of places to lay out your towel or set up your beach chair. There are also a lot of picnic tables (some covered and some in the open). The bay is protected by a breakwater, which keeps the snorkeling area relatively calm even when there's surf. It's easy to see where the best snorkeling is, just look out in the water and you'll see people all over the place. 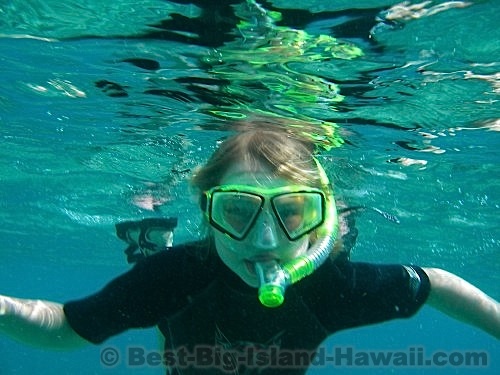 For snorkeling, stay in the South end of the bay. The North end of the bay is exposed to the waves and is usually full of surfers. Surfers normally enter the water at the rocky north end of the bay or from the adjacent sandy beach. This is an excellent spot to learn to surf when the waves are not to big. When the surf is really up, there can be a strong current that makes learning almost impossible. If in doubt about surfing conditions, ask at the surf shop right across the street; and ask here to find out about surf rentals or lessons. Also, for more information on surfing, see our page on Big Island Surfing. 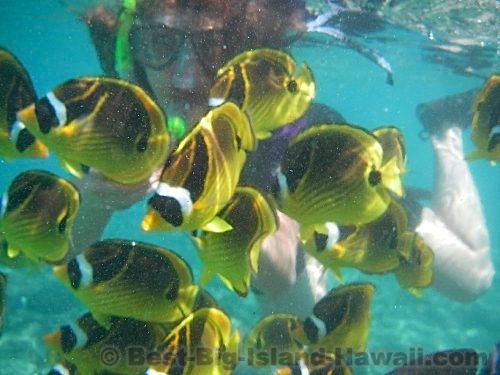 Most people come to Kahaluu Beach Park for the snorkeling. The sea life here is beautiful and diverse. When snorkeling, be careful not to touch the coral. Also, please don't feed the fish. You may see other people doing this, but it's really not good for them. 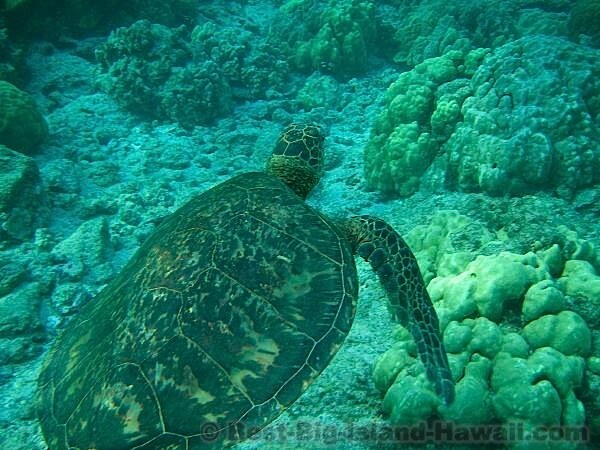 This is one of your best chances to see a sea turtle (honu). If you do see a turtle, be cool and don't just rush straight for it because this will probably scare it away. They are more likely to stay around if you watch them from a bit of a distance rather than chase them. You'll be surprised how close they'll come to you if you're just still and quiet. Disturbing sea turtles and/or touching them is against the law and can get you a serious fine. A great place to rent your snorkeling equipment and other beach gear is right across the street from the bay at Kahalu'u Bay Surf & Sea. Other than swimming while snorkeling, Kahaluu Beach Park is not a great spot for swimming generally. There's sand right where you get into the water (a great spot for kids to play), but further out it's all rock and reef. You can't beat Kahaluu when you're looking for an easy-to-get-to spot with lots to do. Bring your own grill or use the charcoal grills here. Just be sure to leave everything as you found it so that it's just as nice for the next person to use your picnic spot. Don't forget to stay and enjoy the sunset. Accessibility: Easy to get to, right on Alii Drive. 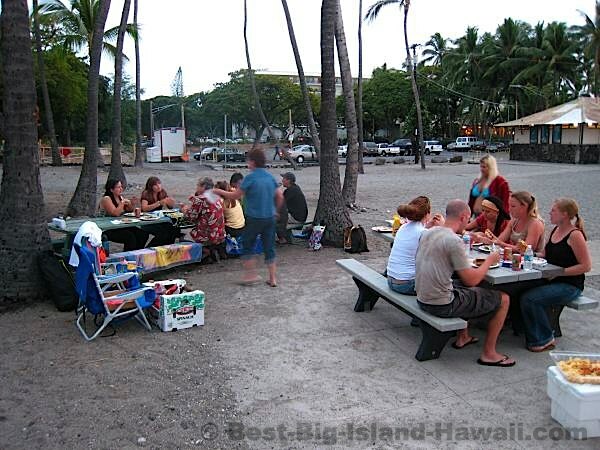 Parking: Parking lot at the south end of the park and on Alii Drive. Swimming: Good for kids to splash near the shore, but mostly rocky elsewhere. Picnicking: Sheltered and open tables with some charcoal grills. My Favorites Here: Looking for sea turtles and watching the sun set. Watch Out For: Strong currents in high surf and rocks.